For outdoors people, like those of us at White Mountain Knives, the term buck brings two pictures to mind. The first is a deer with a huge rack and a penchant for standing still. The second is the Buck survival knife. Buck is a name that’s been around for more than 100 years. Our parents and grandparents grew up with Buck, and there’s a great chance our children and grandchildren will too. But, what makes Buck the cream of the crop? Buck survival knives come from a company established in 1902. They use a unique heat treatment to ensure the blade stays sharp longer and is easier to sharpen when the time comes. They only use stainless steel, and each design is engineered to perform for a lifetime, as supported by Buck Knives’ Forever Warranty. If that’s not enough, the company still uses the art of craftsmanship – something rarely found today. You have thousands of survival knives to choose from. Some are basic, just a folding knife with a strong, sharp edge. Others are nothing less than a fantastic feat of survival engineering. If you’re looking for a Buck survival knife, you have a couple of options. The first is the folding or non-folding Selkirk. This is likely the model you’ve seen your granddad pull out of his pocket from time to time. The second option is the Kinetic series, which qualify more as spears than knives. This line includes a hunting spear, gig spear, and fishing spear. Buck spears don’t come with handles. Each is designed to be mounted on a wooden pole and secured in place with lashing. The spears aren’t your everyday survival tools, but for those who spend more time outdoors than indoors, these are a refreshing addition to your supplies. What are You Getting with the Buck Survival Knife? There are four versions of the survival knife from Buck – Small Folding Selkirk, Folding Selkirk, 853 Small Selkirk, and fixed-blade Selkirk. All four have drop point blades forged from 420HC Steel hardened to Rockwell Rc 58. The Small Folding Selkirk comes with a pocket clip, and the three remaining designs are carried in a sheath that comes with the knife. 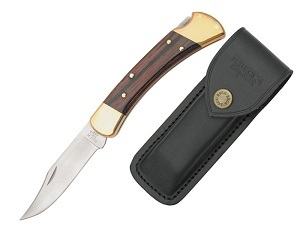 Blades are mounted to a black/brown Micarta handle contoured to fit comfortably in your hand. The 853 Small Selkirk and fixed-blade Selkirk are designed with steel bolsters on the Micarta handle. The rear bolster, at the end of the handle, can be used as a hammer in survival situations. The blades run from 0.125 inches to 0.135 inches and weigh from 4.5 ounces for the Small Folding Selkirk to 7.6 ounces for the fixed-blade Selkirk. At White Mountain Knives, we sell only the best quality knives and survival equipment in the business. How can we claim that? Because we only stock the brands you trust who’ve proven that quality – names like Buck, CRKT, Leatherman, and Kershaw. We also offer the best prices out there with our price matching policy. Take a minute to browse the website at WhiteMountainKnives.com or give one of our survival experts a call at 603-866-4752. We’re here to help you with all your outdoor and survival needs.